Welcome to DMT Stainless LLC. Introducing our Floating BBQ design. Click here for more info. Stainless Steel Cabinets by DMT Stainless LLC. No External seams or joints. Fully welded construction. Custom sizes. Multiple finish options. Cabinets come fully assembled, easy to hang or drop in place. Base cabinets can be made with integrated stainless counter top across multiple cabinets. Heavy-Duty Stainless steel cabinets for restaurants and outdoors. Hello, Welcome to DMT Stainless LLC. 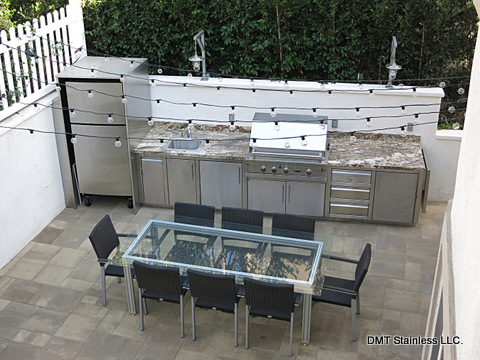 Founded in 1995, DMT Stainless LLC has been designing and building custom stainless products for clientele in Beverly Hills, Los Angeles, and surrounding areas. 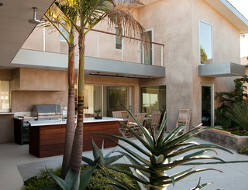 Our designs bridge the gap between form and function. For more information please do not hesitate to contact us. Some featured clients and partners. All products are designed on 3-D Modelling and CAD Software. Everything we make, we guarantee for life.